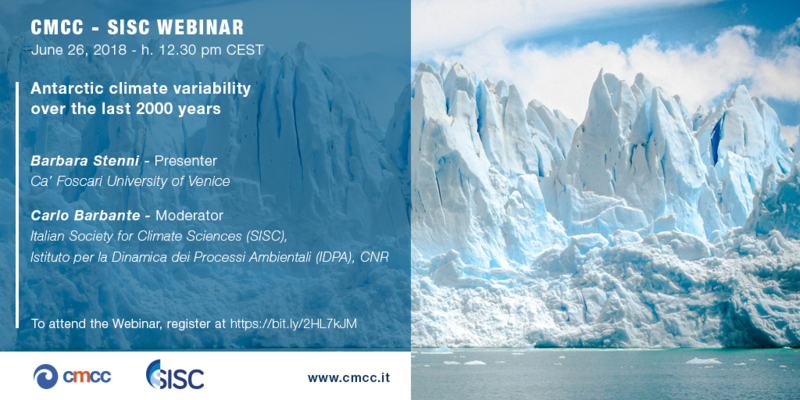 SISC - CMCC-SISC WEBINAR "Antarctic climate variability over the last 2000 years"
Climate trends in the Antarctic region remain poorly characterized, owing to the brevity and scarcity of direct climate observations and the large magnitude of interannual to decadal-scale climate variability. As a result, the knowledge of past Antarctic temperature and climate variability is predominantly dependent on proxy records from natural archives. Paleotemperature reconstructions from Antarctica mainly rely on water stable isotope records from ice cores with the key factor controlling this proxy mainly related to temperature variations. Early efforts to reconstruct the continental-scale temperature history of Antarctica over the past 2000 years indicated that at the continent-scale Antarctica is the only land region where the long-term cooling trend of the last 2000 years has not yet been reversed by recent significant warming. However, this Antarctic temperature reconstruction has large uncertainties and masks important regional-scale features of Antarctica’s climate evolution over the last 2000 years. Here, within the framework of the PAGES Antarctica 2k working group, we present a greatly expanded paleoclimate database including ice core isotope records over 7 distinct climatic regions: the Antarctic Peninsula, the West Antarctic Ice Sheet, the East Antarctic Plateau, and four coastal domains of East Antarctica. We produce isotopic (d18O) composites and temperature reconstructions since 0 CE for these regions. We also produce composites and reconstructions for the broader regions of East Antarctica, West Antarctica, and the whole continent. The first long-term quantification of regional climate in Antarctica presented herein is a basis for data-model comparison and assessments of past, present and future driving factors of Antarctic climate.